Thoughts from Brahma Kumaris: The one who is responsible is the one who is always light. 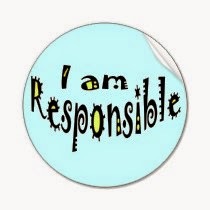 Projection: To be responsible means to do everything with the best of one's ability. It comes with the recognition and the understanding of the importance of the task. No action is wasted, but everything meaningfully connects to the fulfillment of the task. So there are not even ordinary actions, but only those that are meaningful. Solution: When I take up every task that I need to do with full responsibility, I am able to give my best. Then I will be able to be light having done my task well and in time. There is never the pressure of work, but there is plenty of time for the self and for others. I also find my inner resources being used to the fullest extent. To overcome a negative habit, we have to ensure that the intellect is strong and stable enough to lead the mind with knowledge and comprehension. In this way, transformation is more deep and lasting, creates satisfaction and fullness, and greatly improves our self-esteem. Our mind, which is under the influence of an old program, must be left in no doubt that "I", the original personality, no longer wants to go down that old road. We must have the strong determination to create a new thought pattern; this will also be recorded on our memory bank. This new register will help us to avoid taking up the old habits the next time something similar happens. For a period of time the two thought patterns, the old and the new, will exist alongside each other. To achieve a long-lasting transformation, we should not suppress our mind and immediately eliminate all the habits or tendencies to which the mind has become accustomed to. If we do this, the mind will begin to cry and make a fuss, and finally, the moment we lower our guard and stop paying attention, the old habits will emerge again and drag our mind towards automatic thoughts and actions so that, almost without us realizing, we are once again immersed in our old way of thinking and doing. We have an alternative: creating thoughts of a greater quality that emerge from a new conscience. In this way, thanks to these positive thoughts, full of love, harmony and creativity, the mind will start to cleanse itself, replacing the old habits and negative tendencies in a totally natural way. The positive thought that preceded the positive action is still conscious, but the more we repeat the positive action the less conscious we are of the thought that created it. The time comes when we don't know why we are doing whatever we are doing: it has become a positive habit.